Ultra Hair Away™ hair inhibitor frees both men and women from the painful and costly process of waxing, electrolysis, sugaring or laser. 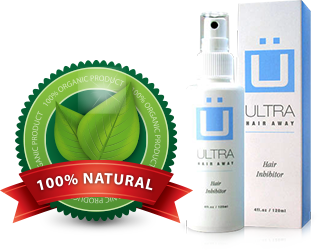 Ultra Hair Away™ progressively and naturally STOPS unwanted hair growth, through enzyme technology - THE COSMETIC MIRACLE FOR EVERYONE! Well, what good is all that hard work in the gym if your definition is hidden under spools of hair? That's the great thing about Ultra Hair Away™ - it's site specific! It only affects the area you choose. 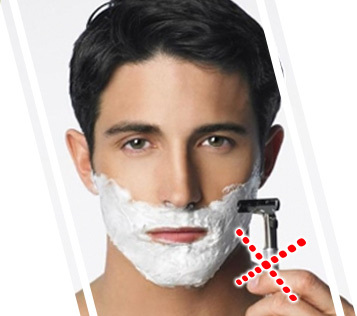 Coarse or Fine Hair; Man or Woman; Even if your Skin is Sensitive - It Does Not Matter! Ultra Hair Away™ It's the result of years of biological research and development. It is a topical solution that is made from an amazing mixture of exotic plant enzymes. Very unique enzymes in very precise quantities. Once applied, it saturates the base of the hair follicle and begins the unique process of stopping hair growth. Ultra Hair Away™ is so easy to use. Just spray, and it goes to work! It's 100% organic, so it's completely safe and painless. 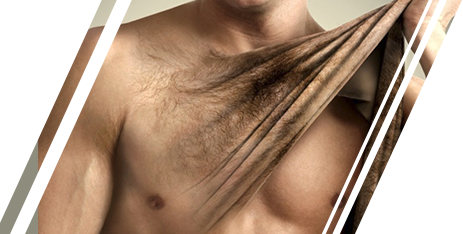 The Solution For Unwanted Hair! 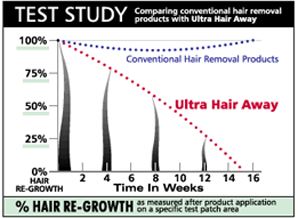 Clinical studies have conclusively proven Ultra Hair Away™ is effective in slowing down, and inhibiting hair growth. The results were also conclusive for gentleness to skin. The test showed Ultra Hair Away™ to be fast, effective and safe for all areas of the face and body. Using Ultra Hair Away™ according to directions causes hair to become thinner and finer over weeks of application, until hair growth is inhibited completely! 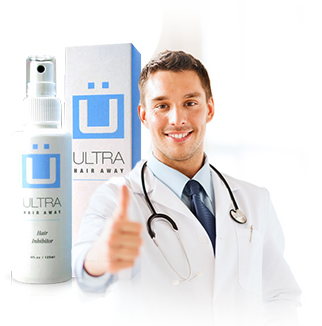 Ultra Hair Away™changes the structure of your hair follicle. Thick coarse hair becomes softer, smaller and finer. It will resemble hair you had as a baby. Soon after - PRESTO! No more hair! You will never be self-conscious again! Beware of Depilatories - Don't Be Fooled by Cheap Knock Offs and Imitators! In the past year a number of dubious hair removal products have invaded and saturated the market, making false claims that they can provide the same results that Ultra Hair Away™ has consistently delivered for years. These products are "depilatories", which are chemical products used to remove hair. They work with acidic ingredients that actually melt the hair from the surface of the skin, and many users of these depilatory products report burns, rashes and pain. These chemical products harshly and harmfully remove your hair, but they do not prevent it from growing back - you'd be just as well off (and certainly less harmed) buying a razor and using that for the rest of your life. So beware, a depilatory will certainly (and very violently) melt away all your hair, but it won't stop the hair from growing back. In an attempt to copy the Ultra Hair Away™ process, some of these low cost imitators have tried to combine a hair removal depilatory with a so-called "inhibitor" - in these cases the "inhibitor" does not work because of the harmful effects of the depilatory. Let's be clear - Ultra Hair Away™ is not a depilatory or chemical product and its formula cannot be duplicated. Ultra Hair Away™ is a safe and all-natural formula which initially slows down hair growth, then ultimately stops hair growth and prevents hair from growing back. If a depilatory product is used prior to or in conjunction with Ultra Hair Away™, it will neutralize the active ingredients in Ultra Hair Away™, so make sure you avoid these chemical depilatory products and never combine them with use of your Ultra Hair Away™. Besides, with Ultra Hair Away™, you won't need a harsh, chemical "short term fix" depilatory - Ultra Hair Away™ is the safe, natural, lasting and long-term solution.